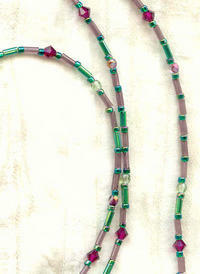 This short (40") lariat necklace is made lavender and emerald bugle beads; 3mm Czech firepolish crystal in pale green and light amethyst; and 4mm ruby red Swarovski crystal bicones. The ends feature a loop and dangle made with a pair of Czech amethyst glass tulip-shaped beads, whose iris finish give them an antiqued look. 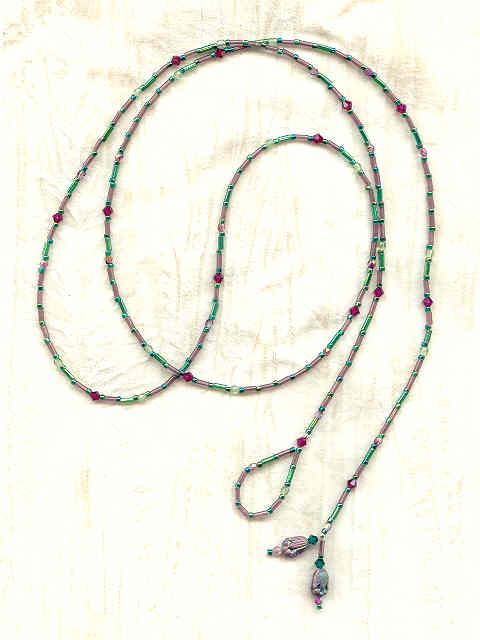 The combination of beads and colours is incredibly beautiful, and will allow the necklace to be worn with a variety of hues ... just as the versatile lariat may be worn in a variety of ways with different styles of clothing. Versatile, beautiful and made to last: must be from SPARKLE PLENTY. All of our one of a kind and limited edition artisan beaded jewelry is individually handcrafted in our studio in Los Angeles, California. 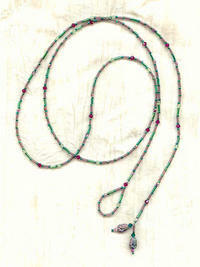 Shop online for unique boutique bracelets, necklaces and earrings and other fabulous fashion accessories. 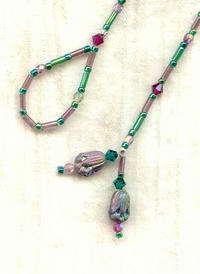 The oval in the center of the pendant looks like intricately carved lavender jade.